It’s a highly unique Control deck that plays like no other deck in the game. Warlock was in an interesting spot for most of 2018. The class had a number of successful decks over the course of the year, but none compared to the success it found with Cube Lock. Cube Lock is a deck that surfaced after the release of Kobolds and Catacombs in December of 2017 and has found a decent spot in competitive play ever since. Cube Lock is a highly unique Control deck that plays like no other deck in the game. If you enjoy hiding behind a wall of minions and draining your opponent dry of resources, this Cube Lock guide is for you. Cube Lock has a number of important cards and synergies within those cards that make the deck flow and work appropriately. 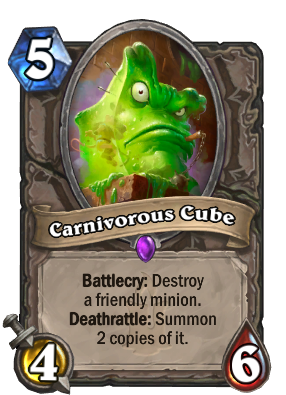 The main card required in order to make most of those synergies work is Carnivorous Cube. The Cube is a five mana cost, four attack, six health minion with a Battlecry that causes you to destroy a friendly minion. The card’s Deathrattle allows you to summon two copies of the previously destroyed minion. At first glance this may seem like a bizarre card since playing it forces you to lose a minion, then risk the Cube being Polymorphed (or something similar) resulting in a huge loss of value. Luckily for you however, this is a Warlock deck, which means you’ll be running Spiritsinger Umbra. This card is a four cost 3/4 that causes you to trigger a minion’s Deathrattle as soon as you summon it. This means if you were to play Carnivorous Cube while you already had Umbra on the field, you would instantly get two copies of whatever minion you destroyed with the Cube’s Battlecry. This combo generates insane mid-game value and can provide a tempo swing that your opponent won’t be able to recover from as long as you use your Cube on the correct cards. So what exactly are you trying to clone with your Cube? More often than not the card you’ll be aiming to clone is Voidlord. 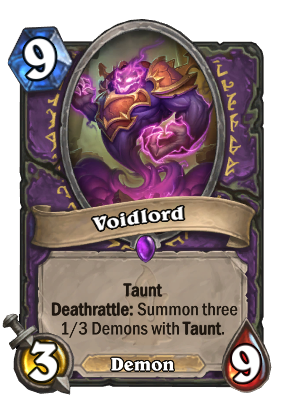 Voidlord is a nine cost 3/9 Taunt minion with a Deathrattle that causes him to summon three 1/3 Demons with Taunt. This means as soon as you use your Cube on Voidlord, you’re instantly getting the three small Taunt minions. Once your Cube dies, you’ll have an even bigger wall of Taunt minions in the form of two Voidlords. This combo results in your opponent having to take down a seemingly endless wall of Taunt minions before they can attack your health directly. So won’t this deck be extremely slow if you have to wait until after turn nine to play your Cube onto your Voidlords? Yes, it would be if that were the case, but luckily this is a Warlock deck, so you’ll be running Skull of the Man’ari. This card is a five mana cost Warlock weapon with zero attack, but an effect that allows you to summon a Demon from your hand at the start of your turn. Your early/mid-game will revolve around holding off your opponent as long as you can until you are able to play Skull of the Man’ari. You’ll want to try your best to get this card in your opening hand, so be sure to mulligan for it accordingly. If for some reason you aren’t able to draw Skull of the Man’ari before turn nine, when turn nine comes you’ll need to go ahead and play your Voidlord. Another card Skull of the Man’ari might pull out of your hand is Doomguard. This card is a five cost 5/7 Demon with Charge and a Battlecry that causes you to discard two random cards. If you summon Doomguard with Skull of the Man’ari, then you don’t have to worry about its Battlecry discarding your hand. A huge tempo play you can use with Doomguard if you’re ahead is to attack your opponent with your Doomguard as soon as it enters play, then to use Carnivorous Cube on your Doomguard. When your Cube dies, you’ll have two Doomguards ready to swing big damage at your opponent. So how exactly do you win with this deck outside of walling off your opponent? The big finish card in this deck is Bloodreaver Gul’dan. This Hero card will summon every friendly demon that died this game. This means any Voidlords or Doomguards your opponent got rid of will now be back on the board once again. Gul’dan also causes your Hero Power to deal three damage with lifesteal. This improved Hero Power not only gives you the finishing power to chip away at your opponent, but it also gives you more late-game sustain, making it even harder for your opponent to drop your health to zero. You’ll want to save Gul’dan for the end of the game, so usually by the time you play him your opponent has run out of big value options. 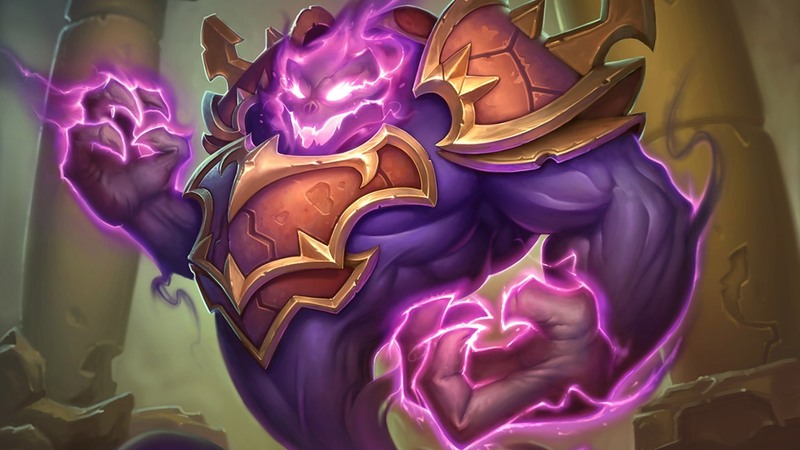 Cube Warlock won’t be available for play when Kobolds rotates out in April, but if you enjoy Control Decks you should give it a try while you can. Since all of the Hero cards from Knights of the Frozen Throne also leave Standard play in April, we can expect the Control Archetype to change in a big way. Hopefully Blizzard gives Control a much needed boost with the expansion it decides to release alongside the rotation in April.